Dragon fruit – the new super fruit, is also known as Pitaya. It is said to possess remarkable health-giving properties. It is native to South America and grows from a cactus plant. Because of the growing nature of its popularity it is being widely harvested in Thailand, Sri Lanka, Vietnam, Philippines and even Bangladesh. The dragon fruit has a delicate smell. The taste and texture is often said to be a blend of kiwi fruit and pear. Sometimes it is also likened to a melon. Its flesh is filled with edible black seeds. The skin is scaly and experts suggest that it is not fit for eating. The red skin of the dragon fruit is not all red but mostly pinkish-red in color; the scales are in tones of green and sometimes yellow too. Dragon fruit is said to be rich in Vitamin C, Vitamins B1, B2 and B3. The yellow Pitaya is said to be a good source of calcium which strengthens teeth and bones naturally, while the red skinned ones have significant amounts of phosphorous which is also essentially needed by the body to function properly. 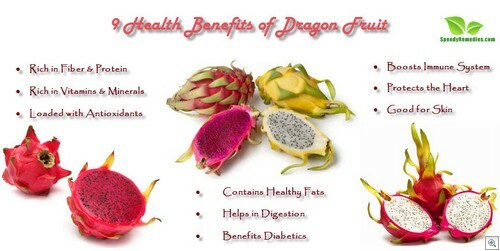 The flesh of the dragon fruit is rich in fiber which benefits those suffering from constipation. Plus, its high protein content makes it a good choice for those striving to lose weight as it boosts the metabolism. Dragon fruit is said to have the ability to lower blood glucose levels, thereby making it a healthy fruit for people with diabetes. In Taiwan especially, people with diabetes are urged by doctors to consume dragon fruit. The tiny black seeds of the dragon fruit are a rich source of Omega-3 fats and mono-unsaturated fats, both of which are healthy fats that do not increase the cholesterol levels in the body. On an average, there are over a 1000 seeds in a dragon fruit. Dragon fruit, being a real food is extremely rich in antioxidants. It has a large variety of antioxidant substances which help the body fight free radicals that may damage the cells and DNA, thus acting as deterrents to many diseases, including cancer. As this super fruit is rich in Vitamin C, it helps a great deal in boosting the immune system and protecting the body from harmful infections. Vitamin C is also said to rid the body of harmful toxins and metals. It also enables quick healing of wounds, cuts and bruises. Eating this fruit on a regular basis is said to be beneficial in fighting against asthma and cough. Dragon fruits are rich in flavonoids that have been linked to having a favorable effect in protecting the heart from cardio related diseases. Furthermore, the healthy fat content prevents cholesterol build-up. Low levels of cholesterol always help maintain a good condition of the heart. Having rich fiber content, eating a dragon fruit will help in digestion as fiber rich foods are known to aid in digestion and relieve constipation. Moreover, it is believed that eating this fruit helps increase the appetite, making it a healthy choice for those suffering from a loss of appetite due to an illness or some other reason. With nearly 90% water content, the dragon fruit is rich in moisture, and moisture is good for the skin. The dragon fruit hence, provides for ample moisture in the diet which, in turn, helps maintain a healthy and glowing skin. Consumption of dragon fruit has no known side effects. However if having it for the first time, eat it early in the day so that if there any adverse reactions, they can be easily taken care of. Including this fruit in the daily diet shall help gain maximum benefit from this super fruit, along with ensuring an overall state of good health.